Thursday, Feb. 28, 2019 at 6 p.m.
Join us for our first Dual Networking Event across the Bay. You get to pick your location: Ichicoro Ane in St. Pete or Four Green Fields in Tampa. Stop by for some free appetizers, nice ambiance and casual convo with your local peers. RSVP for the St. Pete location here, and the Tampa location here. Thursday, Feb. 21, 2019 from 11:30 a.m.-12:30 p.m.
Stake your claim in PR History with the FPRA State Office’s Image Awards webinar. If you’re working on your Image entry, RSVP and dial in on this free, informative chat. Register here. We got an inside look at some of the University of South Florida’s social video production techniques with a panel of USF social media professionals during our December program. Attendees learned how to create your own video content directly from their cell phones, and got additional insight into producing high-quality, low budget video content. We welcomed members of the FPRA State Board and Executive Committee to Tampa for a night of networking with communications professionals from around the Tampa Bay area, and across the state at World of Beer. We boarded a Pirate Water Taxi to learn about the continuing evolution of Downtown Tampa. Guest speaker Kelsy Van Camp, director of marketing and communication for the Tampa Downtown Partnership, talked about her role overseeing the organization’s marketing and communications and how the Partnership is a leader in fostering Downtown Tampa as a vibrant and diverse 24-hour neighborhood. Our new chapter president and board officers were installed by Gordon Paulus, APR, CPRC, president of the Florida Public Relations Association (FPRA). Check out our new FPRA Tampa Bay board here. FPRA Tampa Bay members also networked during our first after-hours networking event of the chapter year, with many more to come! 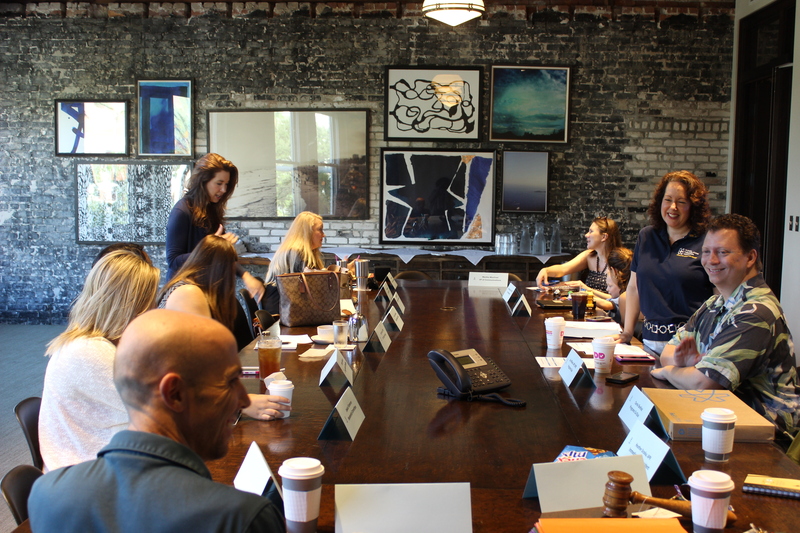 The annual Image Awards luncheon celebrated the top PR pros in the area. Our luncheon was at the historic Columbia Restaurant in Ybor City, and we were honored to hear from special guest Michael Kilgore, chief marketing officer for the Columbia Restaurant Group. When people hear PR, they typically think of media relations. However, most PR professionals handle much more in their day-to-day, from event planning to crisis communication to keeping up with new digital trends. The diversity in our roles keeps things fresh, but it also requires strong time management skills and the ability to balance it all. In February, FPRA State President Ryan Gerds, APR, CPRC, shared the reasoning and purpose behind this year’s theme for the association, Find Your Balance. Former Tampa Bay Times food editor and current USFSP journalism professor Janet Keeler moderated a discussion between local PR practitioners and reporters on effective media relations strategies for meeting today’s newsroom needs. PR professionals discussed what they are doing to adapt in an ever-changing media environment, while reporters provided insight on which traditional media relations tactics still work, and which should be retired. Being a solo professional is highly rewarding, but consultants at all levels have questions. What’s the best way to find new clients? How much should I be charging? What do I need to know if I’m thinking of going out on my own for the first time? Karen Swim of Words For Hire answered all these questions and shared tips and advice for PR pros who were considering going out on their own. Our new board met with chapter members and guests at World of Beer, 5311 Avion Park Drive, Tampa, on Thursday, Sept. 28. We gathered this year for our Annual Conference at Universal Orlando! We celebrated the end of another great FPRA season with our friends from the Tampa Bay Association of Black Journalists during our Sunset Mixer at 400 Beach in downtown St. Petersburg. The Internet can serve as judge, jury and executioner for practically any person’s or company’s reputation. And when it comes to online reputation management, many PR professionals are unprepared for what they’re up against. FPRA Tampa Bay hosted a lunch-‘n-learn featuring online reputation management guru John P. David, president of David PR Group and a partner with WebFactCheck.com. David has been featured in the Huffington Post, PR Daily, NPR, and Today.com. He is a sought-after speaker, appearing at the popular Ragan’s conferences, and is the author of How to Protect (Or Destroy) Your Reputation Online. Sparxoo’s digital experts are bring you the tools of the trade to amplify your digital marketing through social advertising with channel selection, targeting via algorithms, and ongoing optimizations. You have the questions, our experts have the answers. Our local Image Awards luncheon featured a special presentation from Officer Ben Tobias, PIO, Gainesville Police Department. In Jan. 2016, Officer Ben Tobias achieved every social media manager’s dream – a viral video. A call came in to the dispatch center about kids playing basketball too loudly in the street. When Officer Bobby White of the Gainesville Police Department responded to the call, rather than reprimand the kids for being rowdy, he joined in their game. Officer White’s dash cam recorded the whole interaction. The video went viral after Officer Tobias, the department’s Public Information Officer, posted it on the department’s Facebook page. The video was viewed more than 500 million times and garnered national and international media attention. Officer Tobias spok at FPRA Tampa Bay’s annual Image Awards luncheon on April 21. He shared the successes and lessons learned during the whirlwind days after the video went viral, including the experience of a surprise visit from NBA superstar Shaquille O’Neal. Professor Jay Rayburn, Ph.D., APR, CPRC, PRSA Fellow, discussed the building blocks for a successful PR campaign: Research, Planning, Implementation, and Evaluation. We discussed strategies for creating your best campaign. Chris Gent, APR, CPRC. hosted this webinar on how to put together a winning Image Awards entry. Chris has won dozens of Image Awards and state Golden Image Awards. Partnering with one of the fastest-growing digital agencies in Florida – Sparxoo, we explored how content has revolutionized the digital landscape. We chat about the content of yesteryear (circa 1999), content today, and wrapped up with an interactive content throw-down.